Steven Bryan: Graduating from Chain of Lakes Collegiate High School in Winter Haven, Florida, Steven played soccer and ran track and cross country. Steven discovered cycling last year and looks forward to new challenges both on and off the road. Stephanie Bunnett: After winning the overall women’s B title on the road in the Atlantic Conference last year, Stephanie transfers to MHC and will race on the women’s A team. Her addition will bolster MHC’s chances at capturing a national road title. Chandler Hill: Graduating from Dreher High School in Columbia, SC, Chandler was the captain of the cross country team and also competed in swimming and track. 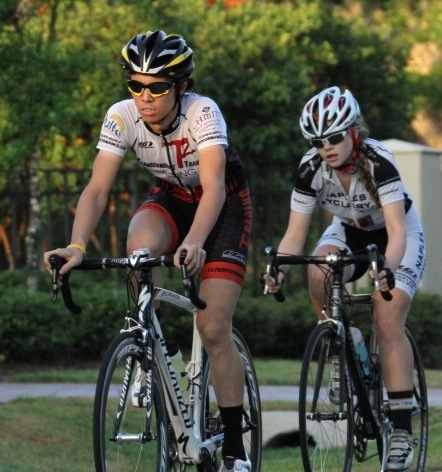 Chandler gained cycling experience while racing for the Forest Acres Cycling Team. Timothy Jenkinson: Coming from South Africa, Timothy will add depth to our mountain bike team. He is a top-10 U23 rider in South Africa and also a multi-sport athlete who placed 2nd in the Xterra Continental Championships. Maitland Jones: Transferring from Tallahassee, Florida, Maitland is a strong all-rounder with a fast sprint, which came to the team’s attention when he beat us all at the FSU road race last spring. Maitland will also compete on the mountain bike. Justin Misenheimer: Joins us from Georgia and will compete with the mountain bike team. Justin has been mountain biking for five years and looks forward to demonstrating his talent throughout the Southeastern Conference during the next four years. Michael Robinson: Transfers from the Atlantic Conference where he finished 5th overall on the road in the men’s A category. With his addition the men’s A team will now have seven elite level riders and the horsepower to take on the strongest teams in the nation.